Over/Under: Over 162.5 at 1.90 Bet Now! This is an all-German clash so the two sides will know each other very well coming into this game. The teams have met twice in European competition so far and both side has a single victory each, so there is a lot at stake in this game. The hosts had a 4-4 record in the regular season while Bayern Munich came through with a 6-2 record by the end of that stage of the Eurocup. Ulm come into this game having lost three of their four most recent EuroCup games, so they know that they have a lot of work to do. 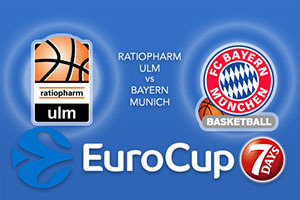 However, they have only lost one home game all campaign, so that will provide them with plenty of confidence for this game taking place in the Ratiopharm Arena. The home fans will be looking towards Chris Babb as he has provided an average of 13.4 points per game so far this season. There has also been good play from Raymar Morgan, who has offered an average of 12.6 points per game while Per Guenther has chipped in with an average of 9.1 points per game. Bayern come into this game knowing that they had a very strong regular season in the EuroCup but it all starts again at the Top 16 stage. Devin Booker has been a key player for Bayern, offering an average of 12 points per game while Max Kieber has chipped in with an average of 9.4 points per game and an average of 6.9 rebounds per game. There has also been support from Vladimir Lucic, who has offered an average of 9 points per game. Another thing in Bayern’s favour is their defensive record, the second best in the league, offering an average of 72.8 points per game. The bookies think it will be close and that the hosts may just have the edge. With this in mind, take Bayern Munich at +2.5 at odds of 1.90. For the Over/Under market for this game, take OVER 162.5 at odds of 1.90. Bet Now!